Beautiful jacket I brought it in brown because the black was sold out. The leather is so soft and supple..just buy one size larger then u normally would..well worth the money. Keep yourself warm during cold weather months with this Sonia women's leather coat from Christian Reed. With its polyester fill and supple lambskin material, this coat provides instant comfort for enduring a cold season. Protect your head and warm your ears from the elements with this women's coat's hood. Achieve a look of sophistication and modern flair with this coat's glossy leather surface, ideal for updating the look of your outerwear collection. Get a slim look with the help of this coat's cinched back waist, ideal for creating a woman's fit. Include the perfect finishing touch to this coat with its faux fur trim. Small size measures 44" in the chest with a sleeve length of 35.25"
Medium size measures 46" in the chest with a sleeve length of 35.875"
Large size measures 48" in the chest with a sleeve length of 36.5"
XL size measures 51" in the chest with a sleeve length of 37.325"
2XL size measures 54" in the chest with a sleeve length of 37.75"
3XL size measures 57" in the chest with a sleeve length of 38.375"
The approximate length from the top center back to the hem is 31. The measurement was taken from a size medium. I was surprised at the excellent quality I received for the great price I got. The leather is soft and supple. The fit was right for the size. It is warm and comfortable. I can't wait for cold weather to return so I can wear it again. I was very satisfied with my purchase of the coat. It was more then I expected. I love this coat! I've been looking for a new leather winter coat for several years and could not find any that I even remotely liked. This coat is beautiful, soft, lamb leather. It's very warm with the liner and hood attached, but when I want a somewhat lighter weight coat, I can remove the liner and hood and still wear it comfortably. I would suggest that you go up about two sizes, since leather does not stretch at all and with the liner you'll need the room to be able to sit down without tearing up the zipper. I originally ordered an XL, but it fit 'too well' and so I returned it and ordered the 2XL. Fits great and gives me a little more room to be comfortable. An extremely good purchase at a fantastic price. This coat is gorgeous! Leather is very soft and the coat is well made. runs true to size. I love this leather coat. It is so nice and warm. I feel like a movie star. I recommend everyone buy this coat . You will definitely turn heads when you step out in this coat. I was excited about receiving the leather coat. It came earlier than expected. However, the cost is sized small. I wear a 2x. The coat fitted like a 1x. Also, The sleeves were also too long. I will be sending it back. Lovely coat, though. The fit was wonderful...I bought a 3x d/t I have large upper arms, the fit worked out great. I bought the brown and I am now about to purchase the black if they have it. This jacket is very high quality. And we had aan unusually cold winter, so I got to use it a lot, eveen the Hood! I would definitely wear this, without the hood , as evening wear. The hood is attached to the coat with a zipper and it came broke so the hood wouldn't even stay on the coat. The return was easy but did not receive a full refund on it, which is weird to me. Not sure I will buy clothing again. "Two questions - Can the removable hood be worn without the faux fur trim? And, is the removable lining a quilted, colder weather lining, or just a thin polyester taffeta? Thanks!" The faux fur is removable from the hood and comes with a 100-percent polyester liner. "I usually wear a 1x...........should I get the XL or 2X"
Hello junebug47, we can appreciate the fact you want a firsthand account of the product. You will receive an email notification every time you get a response. Thank you for shopping with us. "Is the lining faux fur or plain polyester?" Hello buttonbabe, the lining is the same leather like material. Thank you for shopping with us! 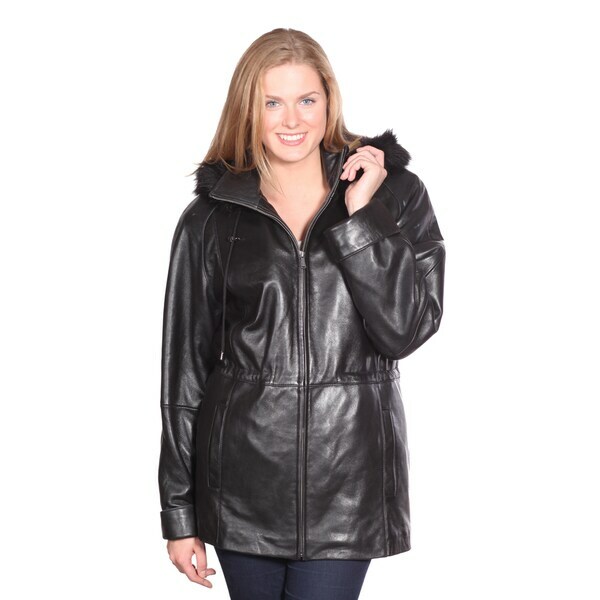 "Christian Reed Women's Sonia Leather Parka - Item#: 16785070 Where is the sewn waist band seam from the collar down the back of the Medium and Large jacket?" Hello mary062760, we are still researching this and should have the answer shortly. Hello mary062760, thank you for your inquiry. Unfortunately, the information you have requested is currently unavailable. You will receive an email notification once an answer is posted. Have a great day. "what size is the 3x?" Hello kimmy, the 3X is extra extra extra large. Thanks for shopping with us! Chest is measured at 56 inches. This is of the coat. "Is the fur on the hood removable?" Thank you for contacting us, darahpete. This has a removable faux fox fur trimmed hood only. Please let us know if you have any further questions. Is the lining faux fur or just plain polyester?